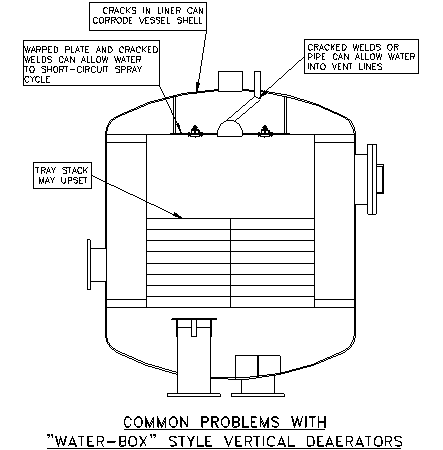 The drawing to the right shows common problems associated with vertical, water-box style deaerators. In essence, the water-box is prone to failure due to cracked welds and warped plates. Kansas City Deaerator can provide a prefabricated head, tray enclosure and header pipe assembly which can be neatly installed into an existing deaerator (see Retrofit Options below). Kansas City Deaerator Company’s system of internals is tried and proven, and is not subject to wear and tear from thermal stresses or pressure fluctuations. The drawing to the right shows common problems associated with horizontal, water-box style deaerators. The water-box welds are inherently prone to failure along the sides and at the ends. In addition, the water-box bottom plate will warp in the event of a vacuum condition in the water-box. 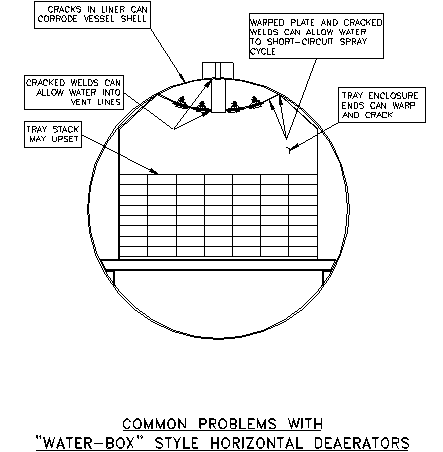 Kansas City Deaerator can provide a prefabricated spray header pipe that can be installed into an existing deaerator, while the tray enclosure is left intact (see Retrofit Options below). Kansas City Deaerator Company can also provide a prefabricated tray enclosure that may be installed as a unit, after removal of one vessel head. Again, Kansas City Deaerator Company’s system of internals is tried and proven, and is not subject to wear and tear from thermal stresses or pressure fluctuations.